← Towards an “Orbanization” of Croatia? Bogdan Droma has worked in Berlin for three months, between August and October 2014, at building the famous Mall of Berlin. As a result of weeks of work going unpaid, as well as of various forms of abusive treatment, he protested together with other workers between November 2014 and February 2015 on an almost daily basis, turning the popular designation of the mall into the Mall of Shame. 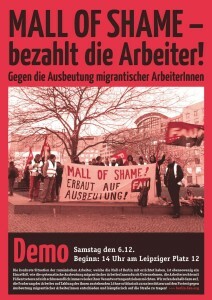 The case of the Mall of Berlin workers is not an isolated one. Thus we wanted, together with Bogdan, to start a conversation regarding non-declared or off the books work as performed by immigrants in the West. Interview conducted by Laura Avram and published in Romanian in Gazeta de Arta Politica (GAP) #12 December 2015. The special issue „In the Name of the Periphery. Decolonial theory and intervention in the Romanian context” was coordinated by Veda Popovici and Ovidiu Pop. The interview is the third out of a small series of materials from this issue, which LeftEast has presented in English over the last month. See also the materials by the two issue editors on the use of the decolonial method for Romanian cultural and political discourses and by Ovidiu Tichindeleanu “No to Transition 2.0“. Translated by Raluca Parvu. Hello Bodgan. Could you start by telling us how you ended up working in Germany? I left for Germany from England, to work at the construction of the Mall of Berlin. We were assured that we will work with a work contract and will be provided with accommodation, but not everything we were promised materialised: we only got work. We were not given a contract to sign, nor decent accommodation. At the beginning we even had to sleep in the street, and the accommodation they found us subsequently was exceedingly expensive. Initially, we were being promised week after week that we will be given a work contract to sign, but then a million excuses were found for not doing it: the accountant is not here, the lady in charge of the contracts is not available, etc. They found excuses, they led us on, and finally we understood: there will be no work contracts to sign. How do immigrant workers end up in such precarious situations, in your opinion? Do you believe such a situation could have been avoided? The borders that opened to us, towards the West, are foggy and dubious, and one needs to work like a slave off the books in order to make some paltry money. There is nobody to protect us when we have problems. Romania’s gates are wide open towards Europe, but Europe, for Romanians, is a modern slavery zone, and there we go, willingly, like a lamb to the slaughter. Nobody puts a gun to our heads to force us to work abroad, they only tell us that over there a wage is about 1500 Euro, and when one hears ‘1500 Euro wage’, one would go anywhere to work, even to China, even at the end of the world. But our authorities do not inform us about things that we should do before arriving there, or upon arrival. There are very few cases of Romanians living a good life while working abroad. Do you think the Romanian or German authorities are aware of these realities? Could they do a better job at informing their citizens? In my opinion, at the level of European governing, the leaders of this Union, are well aware of what the situation of the immigrant workers will be, before ‘opening the doors’. They know what kind of people these workers will have to deal with, the way one knows what goes on in their own backyard. For example, if you have a dog that likes to run away, you keep it on a leash, because if you let it free, it might get hit by a car, something bad can happen to it. I mean you can predict what will happen, but you are fed up with that dog, you are fed up with having to feed it, you want to get rid of it, and you let it free, you undo the leash. You do not open wide the gate for it to leave, you know it has its own little opening for getting out. This is how they have created this opening, this little gateway towards Europe, and the rumor that you’ll be working for 1500 Euro, for 2000 Euro plus food and accommodation. This is the little hole in the fence though which the dog sees a big bone, but as it comes out to get the bone, the passing car runs it over. This is what the authorities have done, this is what the leaders of the European Union have done. They know what will become of us once we leave our country, but they are annoyed at having to feed us and take care of us, so they let us leave. Romanian workers are like dogs going to Europe for a bone, and the car running them over is the foreign company that mocks these people. In conclusion, in my experience and that of my colleagues working abroad, we have doors open wide towards slavery, and only a few very lucky ones have a well paid job and are doing well. But I did not know that before leaving because it is not in the media: only very seldom will the media show Romanians in a harsh situation abroad. We are being lied to, told that it is easy to make hundreds and thousands of Euro, and in this way the state can shed its responsibilities towards its citizens. It is in the interest of the Romanian state that workers like myself continue to leave. I left in order to save some money and return to Romania and manage on this money here. We still have this idea that Western countries, especially Germany, represent models of correctness and respect. Do you think this is true, or is this just a facade meant to maintain the post-colonial illusion of a developed West? There is the idea that Germany is very developed and civilised, but at the same time, once you arrive there as a foreigner, a poor worker, you discover that this is not quite the case, because there are lots of things hidden behind this curtain of development and civilisation. How is it possible that we post clips online and on the TV, newspapers interview us, and we declare that we’ve been working off the books, that we did not receive our pay, that we were not given work contracts to sign, and nobody takes a position? See what I mean, you are told to your face that this mall is being built with illegal, non-declared work and you, as a state representative, take no action? Isn’t it clear that you are smeared too, that you have advantages you want to protect? Well, we were there for three months protesting, we went to the Zoll[i] and filed a complaint, we went to the police, we did everything in our power, but nobody thought of investigating the companies, nobody asked questions. It is clear that this German government benefits from illegal, off the books work, otherwise they would pay more attention to the fate of the migrant workers that come here to develop their country. It is clearly in their interest that people work, without pay, and leave. In this way they are left with development, they have a mall all built up, they have apartments, buildings, they have highways, streets, development at no cost, and of course this suits them. But this isn’t ethical, it should not be allowed to happen. It is in their interest to have this type of exploitative, illegal work, and they facilitate it as much as possible. And they also propagate this myth that things are good and the wages high. Open borders suit them, it suits them that poor workers from Eastern Europe come, work, and leave. But at the same time they make it as hard as possible for us: had we had the possibility of a legal recourse against these companies, they couldn’t have gotten away so easily. But as long as our position is precarious, this cycle of unpaid or very poorly paid work can continue. So you think that Western governments are involved into and want to facilitate this cycle of exploitation? It is in the power of the government to help migrant workers enter a status of legality. They do not do it because it is in their interest to have people working as much as possible in their country for very little money or no money, to develop while poor countries remain poor, or if possible even poorer than before. This way, Western governments will always have at their disposal an ever cheaper workforce from Eastern countries, and they will lend these countries funds – these countries, if sinking into poverty, will automatically need more funds. If poor countries will need more money, Western Europe will help ‘openheartedly’, in order to collect even more money down the road, as a result of compounded interest. “You’re in a difficult situation, we can help you, like a relative would. Here, a loan on 20 years, with an interest rate of x, that you will not be able to repay. Super, cool, if you cannot repay it, you will need to privatise this or that, and you will have to buy from us, how great is that? And our products will be very expensive, isn’t that cool? We will develop together, like brothers, except that you will be our slaves. But we won’t tell you that to your faces, we will manipulate you into a position of slavery”. At the same time, this cycle is benefiting Eastern European governments as well, including the case of Romania, which can wash their hands of the responsibility towards their citizens. Now that you have the possibility of working in the West, the state is absolved from the duty to ensure a decent standard of living for all. This responsibility becomes an individual one: if you want money, if you want to make a living, go and work in the West. If you don’t do it, it means you’re lazy, and in this case why should the Romanian state help you? What do you wish you had known before taking the step of leaving to work abroad? Do you think this experience could have been avoided had you been better informed? I wish I knew there was a high risk of not receiving your pay while working in a different country, and I wish I knew my rights there were nil; even if they exist on paper, no one respects them, because I, as a Romanian citizen, am inferior to a German citizen. The economical hierarchy between our countries is reflected at the level of individuals. Also, I wish I knew whom I am dealing with; I have no means of knowing about these issues but from the experience of other people and from authorities that have received complaints. If you, as an authority, receive hundreds, thousands of complaints, it is clear that there is a phenomenon unfolding that affects people, and the lack of interest on the part of the authorities is huge, to the extent to which it can become criminal. I imagine both the Romanian and the German authorities were confronted with complaints from people that had experiences similar to ours. Our story became better known only because our protests and our refusal to shut up and swallow it made it more visible in the media. Still, I find it hard to believe we were the only ones (in this situation)… I’ve heard many similar stories, but, again, I believe it is in their interest that people do not find out about these stories and grievances and keep on coming to work here from abroad. Indeed, the reason your story is so well known is the fact that you and your colleagues have protested for months on end. Tell me more about it: how did you start, and how did this protest unfold? We started this protest because we did not receive our pay. I couldn’t believe that such thing can happen in Germany. I would have suspected other countries, but not Germany. They used to say that Germans are fair people. My brother had not received his wage for two months, and in my case, approximately one month and a half. But the reason for the protest was not just the money. We protested to get our pay for ten days, maybe two weeks, but after that, it had already transformed into a different protest, because we were treated exactly like slaves. They knew we did not have the resources to fight, that the easiest for us would have been to leave things as they were and go away. Therefore we wanted to pull the alarm, to show what was happening. Romanians are seen as thieves, coming to steal – well, of course! You go there to work, you don’t receive your pay, and you have to go hungry – how can one go hungry? Then one goes and steals a piece of salami in the supermarket, gets caught, and they say ‘those are from Romania, they are here to steal’. How can one avoid stealing if we came here to work and you, the Germans, refuse to give us our money? Who’s the bigger thief: me having worked for you, and having to go and steal in order to eat, or you, a ‘businessman’, that employs me and then refuses to pay me? What should you be called? A tax evasionist? Oh, I see, an evasionist is not a thief, it’s a classier, cleaner version of a thief. Well, I have news for you: you are the greater thieves and criminals, not the ones among us stealing a piece of salami, and you are fighting hard to keep us in this state of impoverishment. But of course this suits you: you keep us in poverty, you oblige us to steal, and then you argue we do not deserve rights, since we’re Romanians and we steal, and for this reason we cannot fight against you, and we cannot obtain our rights and wages. It’s a vicious circle: as migrant workers we are treated very badly, which forces us to take extreme measures, which then become reasons for further bad treatment and denial of rights. What do you think led to this situation? How did Romanians and Eastern European citizens of the EU found themselves constrained to work in the West? Do you perceive the European Union member status of Romania as an advantageous one for the population? The European Union requires equality and reaching European standards. But what are these European standards? The 800-1000 Euro minimum wage? Is Romania, with 1000 lei (approx 225 Euro), at European standards? Did they remove the street kiosks in Romania because of the European standards? I mean, are those European standards always devised for the exclusive advantage of others? That is not fair. It’s only for them, over there, and we are like slaves, modern vassals. We have to follow the word of the emperor. In order for us to have open borders, and to reach your countries in the West, to work in your countries and develop them, we have to respect these European standards that actually burden the population even further. For example, by removing those street kiosks, the street commerce, people were left without means of subsistence, and now they are obliged to go and work in your country in the West. And abroad the wages are not great. If you have left us without work in the name of European standards, we go and work abroad. Now, you pretend you didn’t know what we’d face there? You knew, and it suits you. We have no benefits from this integration in the European Union. We suffer more, and are forced to leave (which we can easily do because the borders are open), and we end up doing unpaid work for you. Europe is taking the piss out of us. I am talking about the European Union. Yes, Europe is mocking us, because we are leaving a very poor country to find work, and we are ready to accept a degrading treatment, a harsh working schedule, difficult work and living conditions, we are willing to work a lot for very little, compared to workers from richer countries. We are working 10 hour shifts with a boss that tells you: “Work faster! Why did you take a cigarette break?” We have a master behind, watching us. Before, the master could whip you, now we have a boss that is perpetually unsatisfied with us, no matter how well and how much we work. He wants more from us, without respite, we have to produce more, even more, no matter how paltry the pay – because of this dream we have, of saving some money. In the name of this dream, the dream of saving money and living a better life, one will work in any place, in any conditions. We have this big desire to make something, to achieve something, and they see that we go there to work in order to save money, and they mock us because they can. They could respect us in the workplace, could give us work contracts, or decent accommodation. If you knock on the door of state employees for paperwork, they either slam the door shut, or they tell you now is not the right moment, or they ask for other papers, and they keep you waiting in front of their doors till you feel like giving up. Meaning, they force you to go back in the streets, or work off the books, or go stealing, although they could simply get the paperwork done. Because it suits them fine. This is why we have protested: to shed some light on what is happening in this country to Romanians and to other foreign workers. 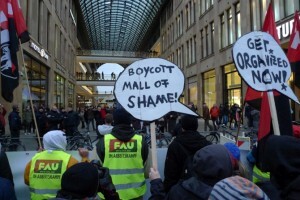 The Romanian workers behind the Mall of Shame protest, with the support of the FAU[ii] Berlin, have brought to court the Mall of Berlin for unpaid wages, and at the moment the results of the lawsuit are pending. [ii] FAU Berlin (Freie Arbeiterinnnen- und Arbeiter- Union Berlin, the Free Workers’ Union Berlin) is an independent, grassroots union. It is part of the Federation of Free Workers’ Unions in Germany, in its turn a member of the International Workers’ Association (IWA).